A juicy burger is one of life’s greatest pleasures in the summer months. Get ready! This is not any ordinary burger! 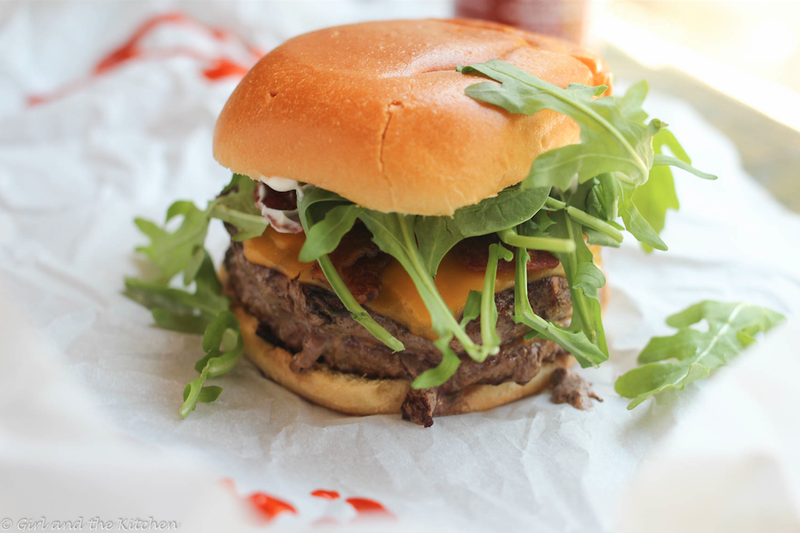 I have amped the classic burger up just in time for #burgerday which just so happens to fall today! Ladies and gents: I present my uber Cheesy and Spicy Stuffed Burger topped with Bacon and Arugula! This will rule your BBQ’s! Few things in life are as satisfying as a big, juicy, American burger. Burgers are quintessentially American. They go along with American Pie, BBQ and Hot Dogs. Imagine watching “Grease” without the diner scenes where they are chowing down on cheeseburgers and milk shakes. It’s not the same. 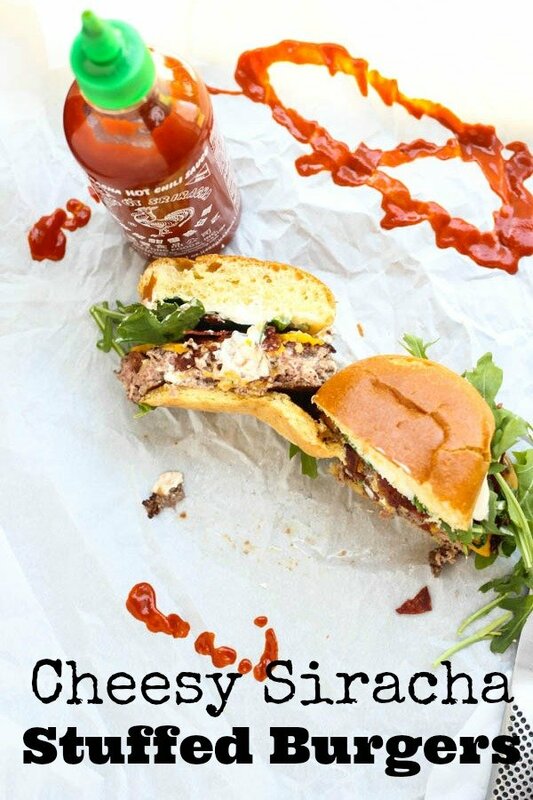 It’s just the American way to have our burgers as a part of our lives. In fact I don’t know anyone who does not like burgers and frankly I wouldn’t trust anyone who chose to dislike them. It seems unnatural. And I choose not associate with such types. Hubs and I are HUGE fans of burgers. Chicken, turkey, beef or bison we love them all. I have even bought the vegetarian variety and while they are not the exact same gratification I can understand how a vegetarian or a vegan would join in and bite into one just for the camaraderie. Years ago, the hubs and I stopped buying those pucks they call burgers and instead buy our own freshly ground meat to make burgers out of. I even purchased him several contraptions to make the perfect sized patty. Nothing beats a fresh burger with gooey cheese and a warm bun. I like mine JUICY! Hubs has finally achieved the art of cooking it to a perfect medium and when we bite into it, that glorious juice runs down your hand and slowly drips back onto your plate. That is burger paradise. A few summers ago we invested in mine and hub’s dream grill: A gigantic and powerful Weber monster! It’s glorious, shiny and most importantly heats up in a heartbeat. Perfect for grilling the ultimate burger. Unfortunately, I live in Chicago. Land of the never-ending, unpredictable weather. On one such a Saturday night, hubs and I were craving burgers. It was a beautiful and warm afternoon and I thought it would be great to grill some burgers while the munchkin chased some bubbles and ran away from the vampire like mosquitoes in our backyard. Munchkin and I headed over to the grocery store to buy some ground meat and other fixin’s. As we walked out of the grocery store, my munchkin’s giggles were overshadowed by the crash of thunder that rolled through the sky. I dashed her to the car and just managed to close my door before the HAIL started. Not just rain. HAIL! Unless I preferred being in an abusive relationship with the weather, our BBQ was cancelled. And we were NOT happy. We decided to do the next best thing and head on over to an upscale dive bar complete with an adorable outside patio and a huge selection of freshly ground and gourmet burgers. This would be the kind of place that would be featured on Guy Fieri’s Diners, Drive-In’s and Dives. Hubs and I both ordered stuffed burgers, his oozing with mushrooms and onions, mine with herbed cream cheese bubbling on a pretzel roll. Munchkin chewed on my fries and grilled chicken breast…apparently judging by the lack of bites in the chicken breast, she was not impressed. I am not gonna lie, my burger experience was not what I expected it to be. 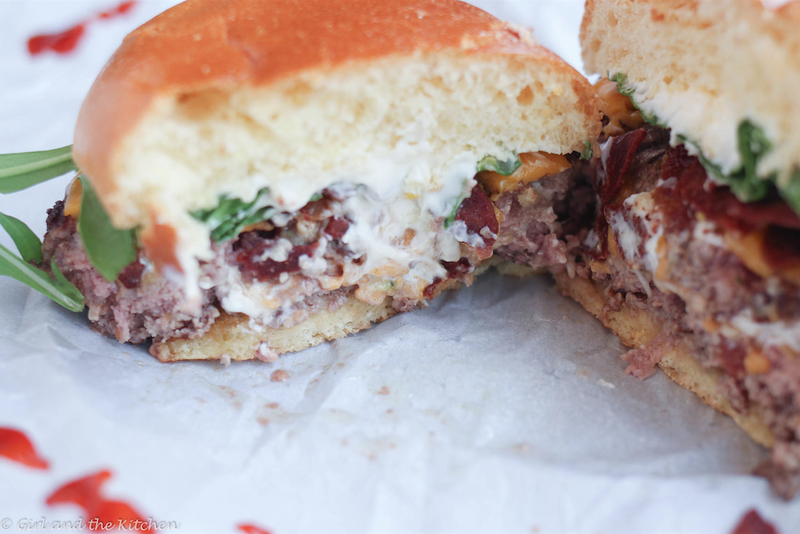 The cream cheese over powered the burger and the pretzel roll was too much flavor as well. There was so much going on in my mouth that I my palate ended up being, dazed, confused and slightly burned. I was not pleased. Hubs was not too pleased either. Our burger experience was a defeat. 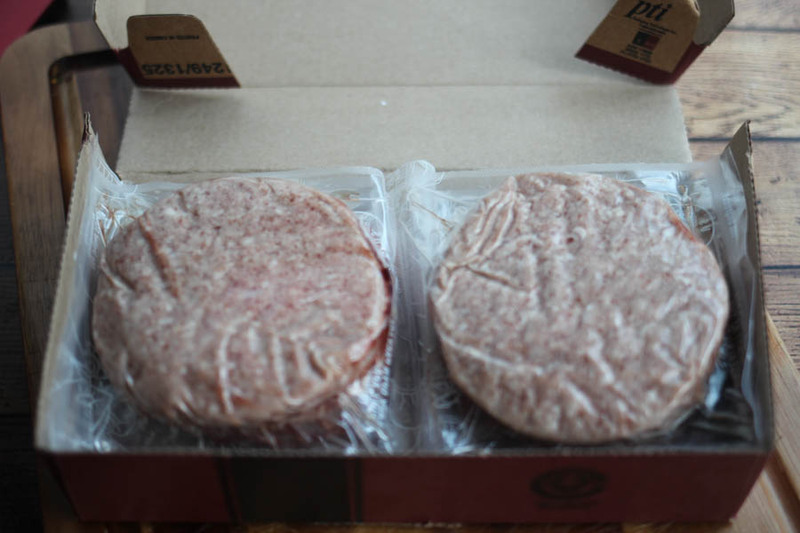 So a few weeks ago when I received my packages from Omaha Steaks, I was pleasantly surprised to find these Gourmet Burger Patties. My mission was clear. 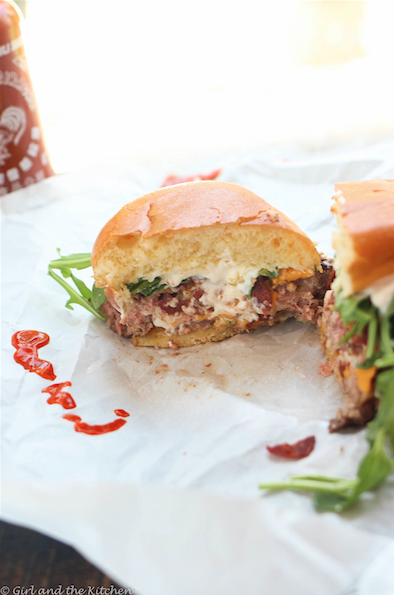 Create a gourmet stuffed burger that did the palate proud. 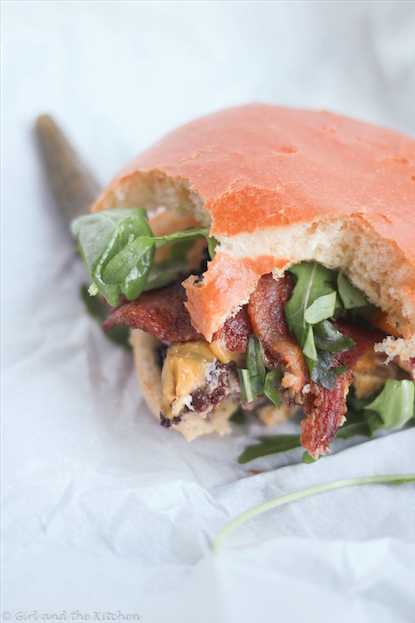 In my opinion, no burger is complete without a little bacon and so I decided to add my perfectly oven roasted bacon to the list of add in’s for this burger. Since the patties were fairly small at 5 oz, I smushed my stuffing in between the two patties to make a nice 10 oz burger. No burger needs much more seasoning other than good kosher salt and freshly cracked black pepper. So that was all that the burger got, well in addition to the magnificent stuffing of cream cheese, garlic, chives, cheddar and…siracha. Much to my luck, it once again chose to rain on this sad day in April and my burger experience would have to be created indoors. 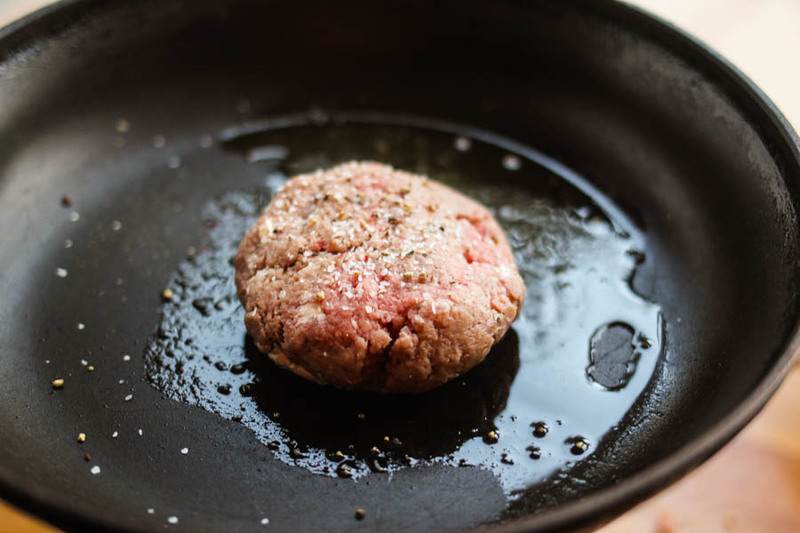 So I prepared my favorite searing tool, the cast iron pan, to do my burger justice. And it did. The sear was gorgeous and I threw it into the oven to finish off to a perfect medium. Once I removed it from the oven I added on a nice sharp cheddar, placed a few tablespoons of water into the pan and closed it with a lid. I found that the ultimate bun for a burger experience was a nice sweet and soft brioche bun. 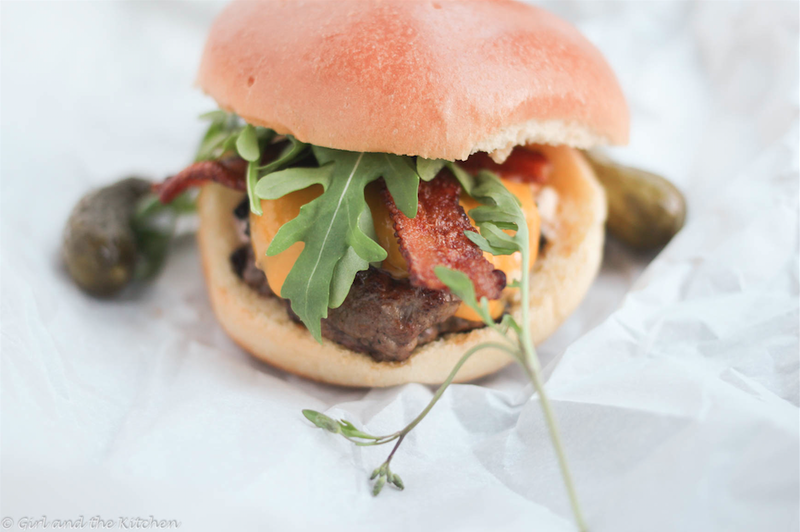 The burger was finished off with a few fresh and peppery leaves of arugula and my oven roasted bacon. I cut it open and just watched the perfect ooze factor happen. Tender meat + oozey cheese+crispy bacon= Ultimate Burger Experience satisfaction. Want to know what goes perfect with a burger? 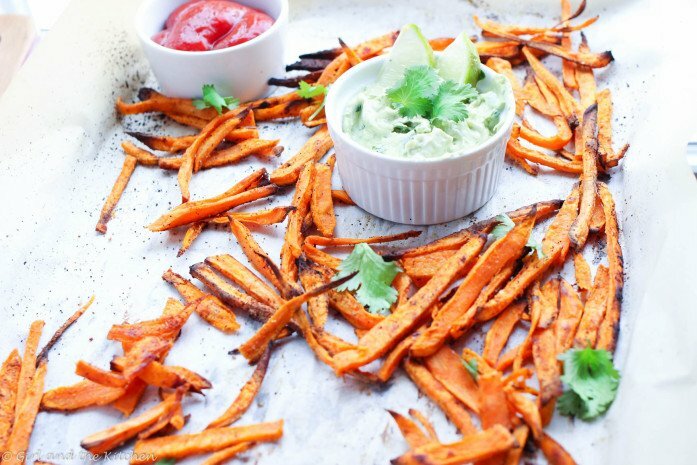 Sweet potato fries…these golden and deliciously baked babies are always a hit!!! Plus you get a bonus sauce with them!!! WINNING! 1 box of 16 Omaha Steaks Gourmet Burger Patties. 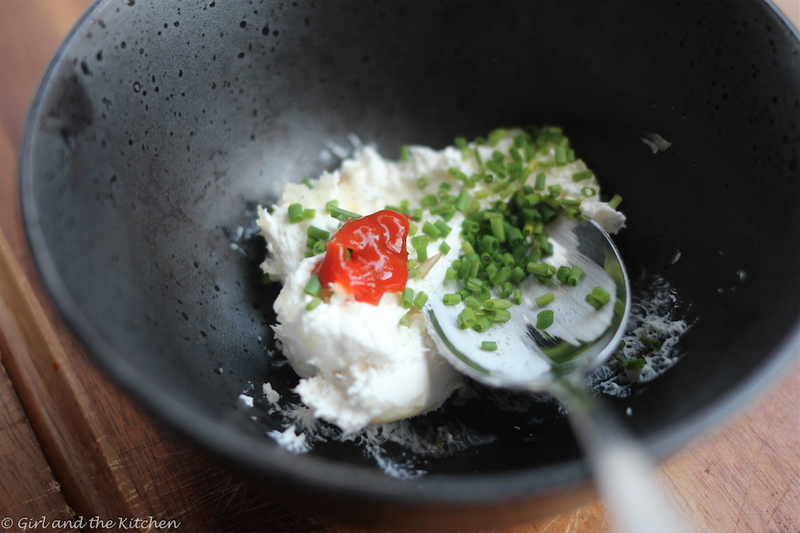 Combine cream cheese, shredded cheddar, garlic, chives and desired amount of siracha. Unwrap the burgers, you will need 2 per burger. Place about 1 tablespoon of the filling on top of one burger patty and then place the other patty directly on top. Carefully smushing the sides together so that they create one large patty. Season with salt and pepper. Sear on a grill or stove top in a thick bottomed pan. Serve immediately and invite guests to cut it down the middle to reveal the oozeing cheese.